I’ve heard from some of you, insisting I MUST have my facts wrong. 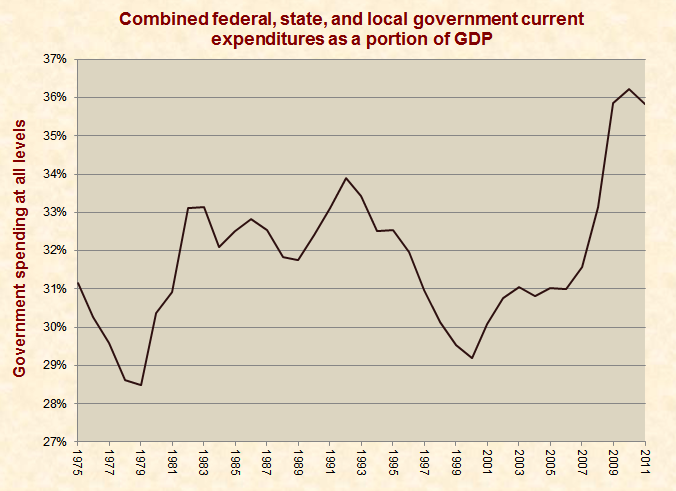 After all, government spending has gone down over the past 3 years – not up. You know this because the esteemed Paul Krugman drills on this in every other column he writes and blogs about it daily. Besides, The Annointed One of 1600 Pennsylvania Avenue would NEVER LIE!!! Funny, but I think those of you following that line of thinking are either (a) hoodwinked by the President or (b) Obama sycophants. The chart below was compiled by the Federal Reserve, and like most FEBR data, excludes inflation. But you’ll note that the increase in government spending as a share of GDP (and therefore, the commensurate reduction in GNP) eerily match the curve I developed. So…..phhhhbbt. Stop listening to the liar-in-chief and his apologists. Learn how to do a little basic research on your own, people. Oh, my…this IS the reason the economy hasn’t recovered! This entry was posted on May 10, 2012 by Ray Rothfeldt. It was filed under Economics, Politics and was tagged with Barack Obama, current-events, Economy, Liars, Obama Apologists, Paul Krugman, Politics.